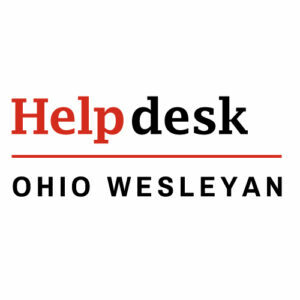 Ohio Wesleyan University uses Lanier’s MP Series multi-functional devices on campus that have printing, scanning, e-mailing, and faxing capabilities. Tap the Job List button if it’s not already highlighted. Tap the Job Details button. Tap the Job History button. 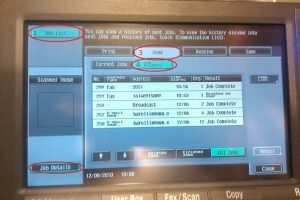 You should be able to do this whether you’re in User Box, Fax/Scan, or Copy mode. 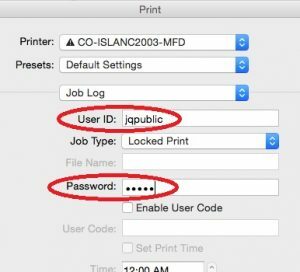 Go to the print dialogue for any program on your Mac, and expand the printer options by pressing the show details. Drop down the section selection list, and choose Job Log. 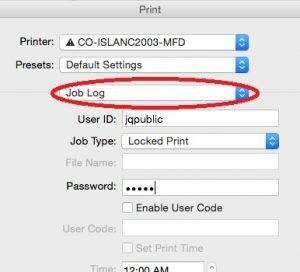 In the Job Log list, select Locked print. Click the Print button at the bottom of the print dialogue window. Tap the Printer icon on the screen. Tap the Print Jobs tab. Tap your User ID under Select User ID. Tap the job you wish to print in the Select Job(s) list and click thePrintbutton at bottom right. Type in the password using the numeric keypad on the right. You may change the quantity or detailed settings. When ready, tap the Print button. Your document will now print. Tap the Exit button at top right. 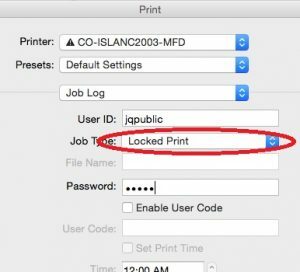 Change the Job Type, below the One Click Preset List, to Locked Print. Click the Details button to the right. Either type a User ID in the box to the right or click the drop-down button and change it to Windows Login Name. 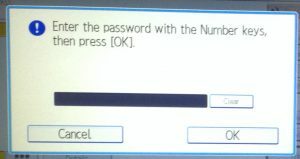 Enter a 4 to 8 digit numeric password in the box below. Click the OK button at the bottom of the Job Type Details windows. You may register this locked print as a One Click Preset by clicking the Register Current Settings button and giving your new preset a name and an optional comment. It will then appear in the One Click Preset List. Then click the OK button on the bottom of the MFD Properties window. Tap the job you wish to print in the Select Job(s) list and click the Printbutton at bottom right. Drop down the section selection list, and choose Layout / Finish. Be sure you’re on the Layout tab. In the Print Type drop down list, select 2-Sided. Ensure that the correct MFD is selected, and select Properties. Under Print Type, select the drop down arrow and select 2-sided. To specify a paper setting Press the Paper on the touch screen and select the desired paper drawer/size. You can copy onto various types of paper, such as envelopes, OHP transparencies, thin paper, and thick paper. You need to specify the type of paper on which you are going to make copies. 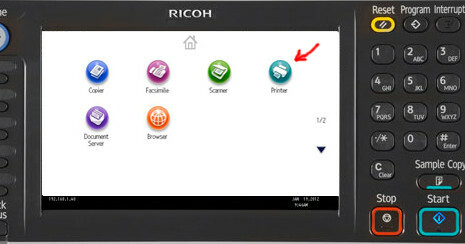 To reduce or enlarge Press Zoom on the touch screen and select a preset or use the + and – buttons to change the ratio. When reducing or enlarging it is best to specify the output paper size (see previous bullet). The default Zoom setting is x 1.000, this means that the copies will be made at 100%. 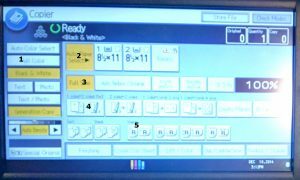 To make to 2-sided copies Press Duplex/Combine on the touch screen and select the desired option. The default Simplex/Duplex setting is 1 > 1 this means the copies will be 1-sided. To select Staple or Hole Punch Press Finishing on the touch screen and select desired options. Sort, Staple and Hole Punch may all be selected together. The default Finishing setting is Sort and Offset. This means that the pages of the copy job will be collated in order and offset on the tray to separate each set. For more information see the link to the manual in the Exernal links portion of this FAQ. Press the Scan button on the home screen on front panel. Place originals in the Document Feeder or on the glass. If the email destination is not stored, select Manual Entry and type in the email address. 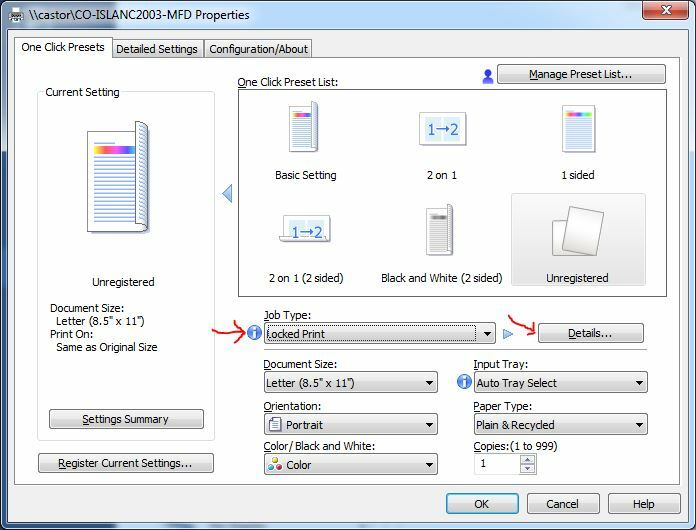 If you are scanning in a two-sided original, select Original Feed Type, select 2 Sided Original, Ok. Select Scan Settings and then change the appropriate settings like resolution or color mode. Load the envelopes in either Tray 1 (face up) or the Bypass Tray (face down). 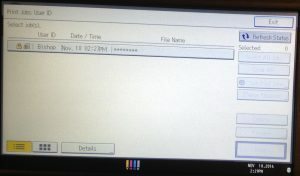 When feeding envelopes through the bypass tray, a screen will pop up on the panel that relates to the bypass tray settings. In order to register the envelope size, select Change Tray Settings. Select Envelope under Paper Type. Next, select Standard Size and choose Com 10. Then If you feed the envelopes through tray 1 instead of the bypass, a screen will pop up with question marks in the paper source box. Select Tray 1 and hit Change Size. Repeat the steps from above to enter the envelope size. When finished registering the size, hit OK.
Click on Paper Source and select the tray in which you loaded the envelopes (either tray 1 or bypass tray). Select Print from the File menu, and choose the Properties option. Under the Original Size drop down, choose Envelope Com 10. Select Envelope under Paper Type. Click OK, and then Close. 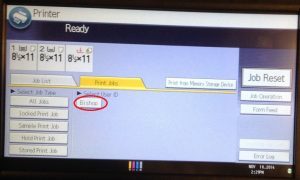 (You are not actually printing yet, you are simply setting the driver correctly). Select the Tools tab, and click on Envelopes and Labels. Type in the relevant information and select Print. Walk to the machine and obtain the envelopes. Put thick paper into bypass tray. Note: the Bizhub will only print certain image files (pdf, jpeg, tiff, and xps) from external devices. Plug your USB drive into the USB port on the side of the Bizhub. After a second, a screen will automatically pop up asking what function you wish to perform. Most times you will only have the option of printing a document from external memory. Tap that button. This will display a Print tab with a display of the folders and files on your USB drive. Navigate to the file you wish to print by tapping folders, using the Open and Up buttons, and tapping the file name. It will tell you which file you have selected and allow you to adjust print settings. 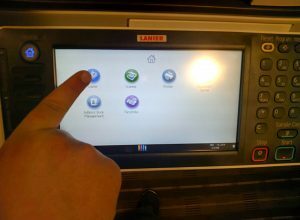 Press the Start button to print your document. Before a document can be saved, a box must be registered with the following steps. For more information see the link for the manual in the External links portion of this FAQ.